With summer heat taking its toll on people, F&B manufacturers have come up with coolers with a twist in flavours. Lassi which is considered to be the best cooler for summers, is being launched in different flavours by brands including Amul, Gowardhan and Mother Dairy. These products are being launched at the right time so as to capture the market and consumer sentiments. Indian taste buds are always looking for some typical summer flavours when it comes to coolers. Brands till date are majorly offering rose, mango, badam and pistachio flavours. But looking at the kind of transformation happening in the flavours of other dairy products including milk, yoghurts and ice creams, the consumers will soon be wanting more from lassi. “Indian consumers want something new every time. So to fulfill this demand we are working towards bringing more flavours which will be created from exotic fruits,” Munish Soni, Deputy General Manager, Marketing (Milk), Mother Dairy. Though the conventional flavours are still doing phenomenally well, coming of new flavours would only increase the number of takers. While on the other hand, Gowardhan, which has only two weeks back forayed into the arena of flavoured lassi, with its brand Go Lassi, apart from the conventional flavours has brought in a fruit flavour,i.e., lychee. Lassi has been considered to be a seasonal product which can be consumed only during summers. But these players are breaking the jinx with supplying flavoured lassi all throughout the year. “The demand for flavoured lassi is present throughout the year. Though we might see a downfall in demand by about 20 per cent during heavy rains or severe cold, but we plan to sell it throughout the year,” says Devendra Shah, Chairman & Managing Director of Gowardhan. With flavoured lassi, brands are targeting specific regions of the country, as they are still trying to create awareness among people. While Mother Dairy which has its strong roots in the North of India is targeting the Delhi/NCR region along with cities including Chandigarh, Jaipur and Haldwani; Gowardhan is shifting from its comfort zone which is Gujarat to South India with flavoured lassi. It plans to start off with cities including Bangalore, Chennai and Hyderabad. Mother Dairy is selling its flavoured lassi through 5,000 retail outlets in the specified region along with all the modern trade, cold storage being the main criteria. Moreover, in order get to their customers Mother Dairy also indulges in various promotional activities, creates shop visibility, and does sampling and various radio ad campaigns. Mother Dairy produces and sells 10,000 litres of flavoured lassi every day. On the other hand, Gowardhan plans to sell through its channel of 20,000 retailers and also modern trade. “We will be doing a lot of promotion among consumers majorly through sampling and also through shop visibility,” adds Shah. 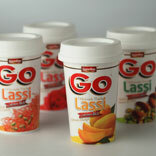 Gowardhan is currently producing 3 tonnes of flavoured lassi everyday with all being consumed the same day. With the rise in demand for the flavoured lassi, brands are planning and expecting better results for the next year. “With launching of Go Lassi we plan to achieve revenues of Rs 20-25 crore from this segment by the end of next fiscal,” says Shah. Moreover, a brand like Mother Dairy which has made its mark in the industry now plans to penetrate further into markets. “We plan to penetrate further in other cities which have a huge potential. With this, we are looking forward to a 50 per cent growth y-on-y,” concludes Soni.